t*rexes and tiaras: i don't wanna lose you, so don't skip town.. These boots have been waiting for an outing since I won them on eBay months ago (don't panic, it was long before the shopping ban!) 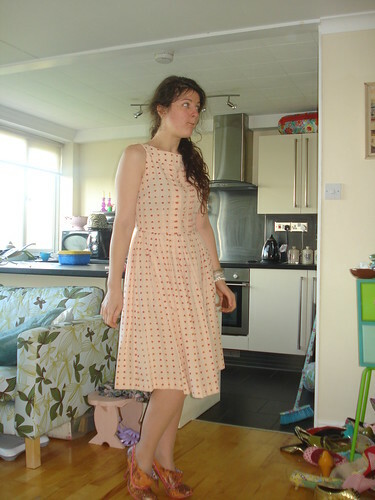 and I finally decided they would sort of go with this dress, which has been one of my favourites for years; I snapped it up on eBay years back after not managing to track down the size I wanted in store. Today's been another hectic one to start another no doubt hectic week, but I'm pleased that I managed to have a really productive weekend - got lots ticked off the to-do list, sold more things as part of my big Spring Clean, and planted plenty of seeds, both in trays on the windowsills and down at the allotment (and then worried about the little onions when it was cold last night). Feeling a lot﻿ more positive after getting all upset after being criticised by my DC about guides. I have changed my plans in light of the concerns she's passed on, but how am I supposed to solve a problem which I didn't know about. I'm also off to try out zumba for the first time this evening, after work and prior to my guides meeting. Wish me luck; I'm really not the most co-ordinated person. Glad your feeling brighter. Hope you enjoy zumba. that dress is lovely, I need more midis for the warm weather. Did you like zumba? I always think it's unfair when you don't get feedback but are expected to know what others are thinking! I'm far too uncoordinated for zumba! Hope you enjoyed it. Looove, love, love this dress! !